Restaurant in the Petronas Twin Towers combines good food with an impressive view. DINING way above ground level seems to be a trend these days with contemporary restaurants serving a view to go with the meal. One of the most talked about sky dining venues is Marini’s on 57, and as its name suggests, presents an impressive 360-degree view of the Kuala Lumpur City Centre (KLCC) from level 57. Floor to ceiling glass panels add depth and space and there is a magnificent view of the Petronas Twin Towers from The Bar. Friendly hostesses usher guests to either the cigar and whisky lounge, rooftop bar or Italian restaurant, once you bypass intimidating bouncers at the ground floor heading up to this venue in the sky. The Bar is abuzz even before the sun goes down, as its ambience sets the right tone for guests to unwind after a long day at work. As a prelude to dinner, bar operations manager and head mixologist Junior whipped up the signature cocktail ? Marini Mellow Sundown (RM35++) for us to taste, which came with The Cucumber Lady (RM30++) and White Dame (RM30++). The sunset-hour cocktails, he said, changed every night to allow customers a chance to experience a plethora of exciting mixes. The Restaurant at Marini’s on 57 is a formal dining space with attention given to details. Dining at The Restaurant allowed us to experience a shift in ambience, from a relaxed place to a more formal dining space. The food is prepared from scratch with emphasis given to imported ingredients and fresh produce. To start, we savoured black pea-sized Beluga caviar on fluffy blini, served alongside an assortment of condiments that got our taste buds raring for more. The blini, made from a combination of buckwheat, egg and buttermilk, are enjoyable little pancakes that one can go on eating especially with such tasty roe. For those who prefer bread, Melba toast named after Dame Nellie Melba, an Australian opera singer, offers satisfying goodness including a vodka shot in a translucent bubble for a taste of bliss when you bite into it. We enjoyed the antipasti of Maine Lobster and Buratta Salad with extra virgin olive oil and baby herbs. The soft white textured buratta can easily be mistaken for mozzarella but the former is made from mozzarella and cream. Slicing into the buratta unveils a soft creamy cheese that is luscious with the chunky lobster meat. Eye for detail: Chef Michieletto garnishes the blini with a variety of condiments. Chef Federico Michieletto prepared a plate of Tagliolini Pasta with Fresh Truffles to sway our taste buds to another flavour. Vegetarian dishes are not big on my list but with its combination of Piedmont truffles and Parmesan, the dish was mouthwatering. Known for his mastery of Italian cuisine, chef Michieletto said the liberal use of egg yolks gives the pasta its exuberant richness. My other favourite was the Roasted French Duck Magresse, Enviva Blanca, Peaches and Honey Glaze, where female duck is preferred for the recipe to be perfect. “The female Moscovy duck has more fat and is less gamey, hence its tenderness and taste,” said Michieletto. The chef enjoys goby (local soon hock) and lets it shine in his serving of Pan-roasted Goby Fish with Spinach, Duck Liver and Cream Sauce. “Soon Hock is one of the best local river fish. I was experimenting with it one day, and found that it pairs well with foie gras,” he said. 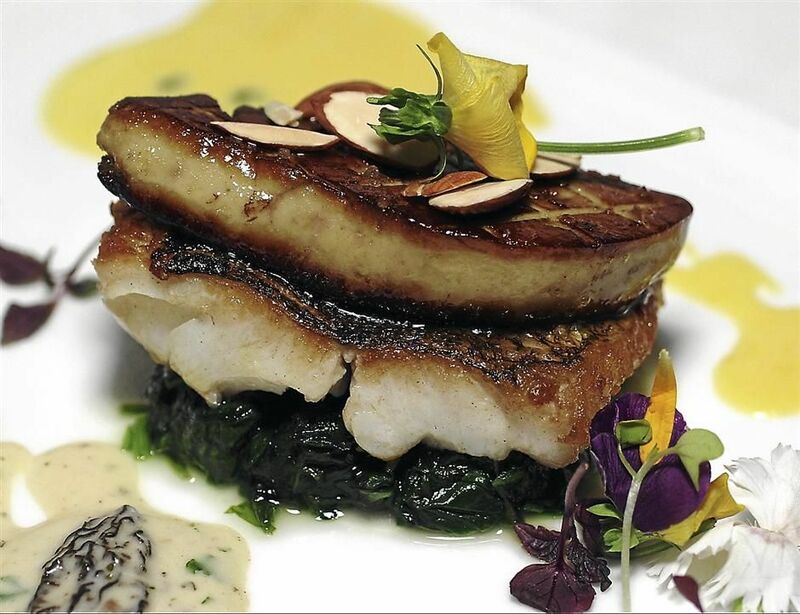 Pan-roasted Goby Fish with Spinach, Duck Liver and Cream Sauce is a well-composed dish. The caramelised foie gras steak had a velvety texture and salty taste, that danced along nicely with creamy spinach and morel mushrooms. However, as we were only served water for dinner, the prominent flavour of the fish and liver stuck hard to the palate making it difficult to appreciate the Roasted Australian Lamb Rack, Beetroot, Feta Cheese and Rosemary Essence. Priced at a handsome RM198, the nicely done lamb rack gets a play-up with beetroot boiled in vinegar and sugar, and roasted beetroot. It was a good thing that every time a dish was served, chef Michieletto showed up to explain the ingredients used or how it was conceptualised. His attention to us as guests made up for our young PR hosts? lack of social graces as both were rapidly texting on their mobile devices. Dinner, I must say, ended rather colourfully as the waiters brought out huge multi-coloured cotton candy for a sugar high before the Chocolate Sphere with Bon Bon Lollypop and Hazelnut Mousse made its entrance. 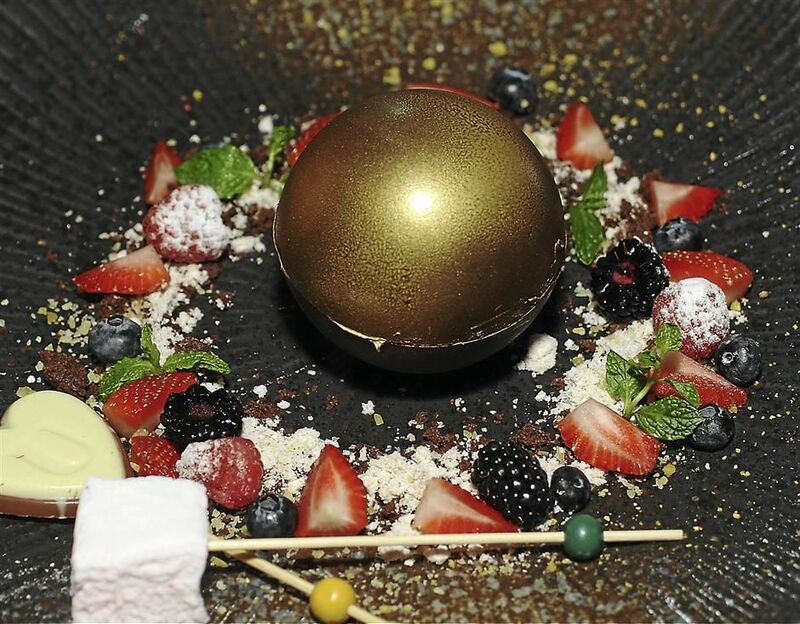 The chocolate sphere bon bon and cotton candy are a child?s dream dessert for the vibrant colours, not to mention their delectable taste. It did not end there, as chef Michieletto did not want us to go home without tasting the restaurant?s array of cheese, which I must say was hard to resist and an impressive finish to dinner.